Publication in a reputable, peer-reviewed journal should be the goal of all researchers, as publication is the main means of disseminating the results or findings of what can often amount to years of research. Career advancement these days is, to a large extent, dependent upon publication in reviewed journals. The applicant with an impressive list of published journal articles will be ahead of those with a meager portfolio of published work, or none at all to their credit. This book shows you how to structure your article. There is ample guidance given in planning your article, breaking the material down by using headings, and the details that go into each section of your article - Introduction, Methods, Results, Discussion, Conclusion and so on. There is a guide to reviewers and their role in publication - what they will be asked to consider, and the process your article will go through before acceptance by a journal, as well as information about using references and compiling lists of references. This book will show you how to edit your article, and there is a comprehensive checklist so you can ensure your article should be much closer to that goal - acceptance for publication in a peer-reviewed journal. There is useful information about the use of illustrations, graphs and tables, and how to submit the data used to compile the graphs. 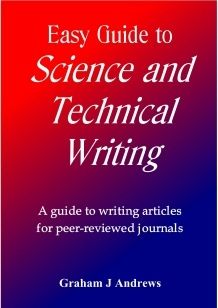 This book will be suitable for anyone wanting to write for peer-reviewed journals. To read a sample of this book, please click here. 11 You Are Almost There!